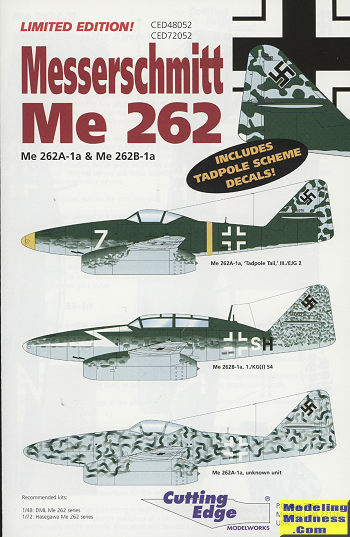 This nice sheet from Cutting Edge provided markings for three aircraft. A nice selection of types as well including a two seater. While the instructions recommend the Hasegawa kit, I think that the Revell version might be a better choice, especially in terms of availability as Hasegawa kits tend to disappear from the market from time to time. The first option has a 'tadpole' camouflaged tail. CE provides a decal for this all these were masked and virtually identical on planes that had them. The upper surface is RLM 83 so you need to find a shade to match the fin. Undersides of all these is RLM 76. This plane was with III./EJG 2. Next is a two seat trainer with 1./KG(J) 54. Instructions are not clear on the upper color stating it is either RLM 81 or 83. It does state that it is a solid upper surface shade. The final option is with your favorite unknown unit. Colors are conjectural so you need to read the instructions. One thing it does say is that this scheme is more like what recce 262s carried with the upper surfaces in what appears to be a lightened RLM 71 with RLM 70 squiggles. 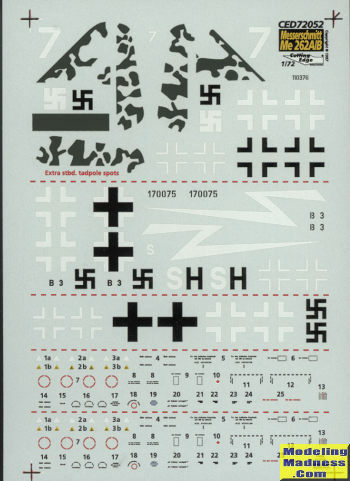 The sheet provides sufficient data markings and insignia for two of the three options.